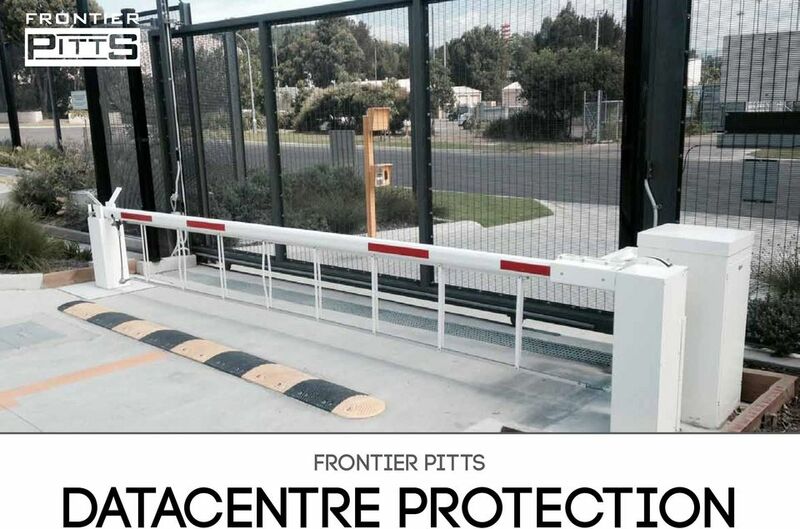 Download "FRONTIER PITTS Datacentre Protection"
2 Introduction Bespoke protection for Data and Cash Centres Frontier Pitts secure various Data Centres and Cash Centres in the UK and around the World, with a variety of equipment from both our HVM impact tested portfolio and our Security Range. Clients include MSN and Google in Dublin. 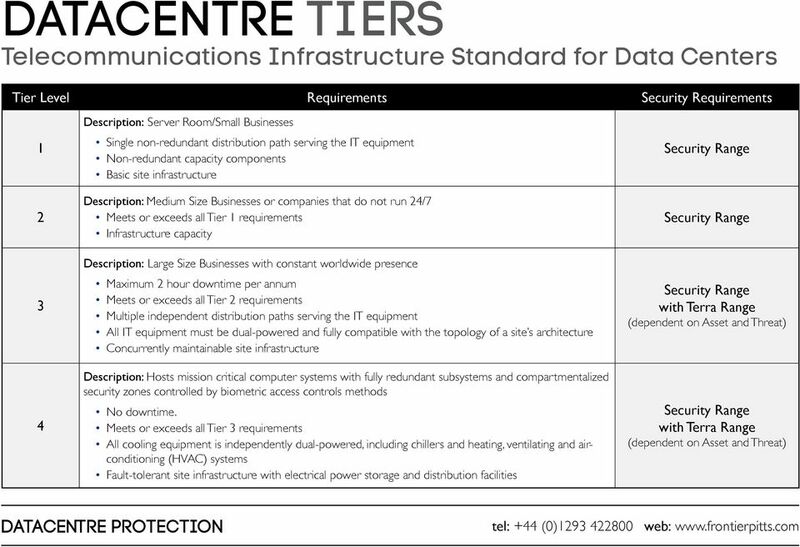 As the UK s economy has become increasingly dependent upon information for delivery of online services and governance of major organisations, commercial Data Centres are recognised as an essential asset of the British Critical National Infrastructure (CNI). 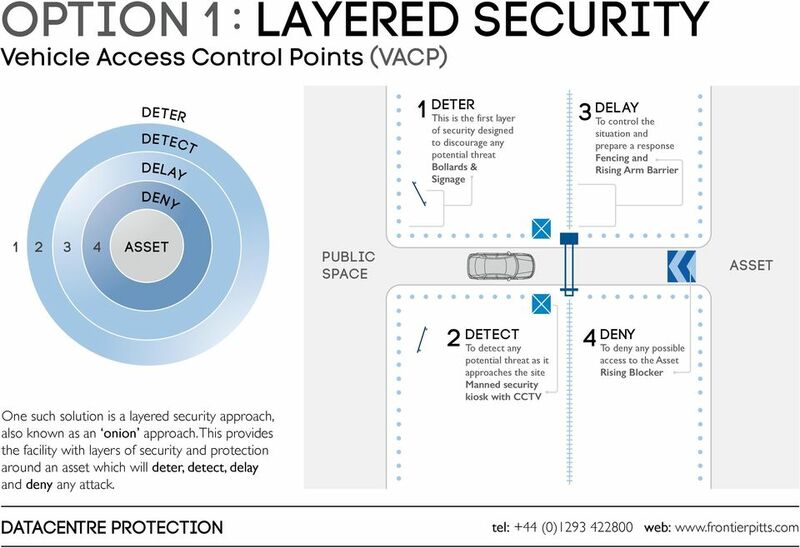 The main purpose of any type of security is to protect an asset. An asset can include people; staff, visitors, guests, or physical assets; buildings, contents, equipment and sensitive materials. Depending on what the asset is will depend on the threat level. The threat level may remain constant, or may change throughout the day, month or year depending on an event (i.e. Crowded Places venue) or the current political environment. 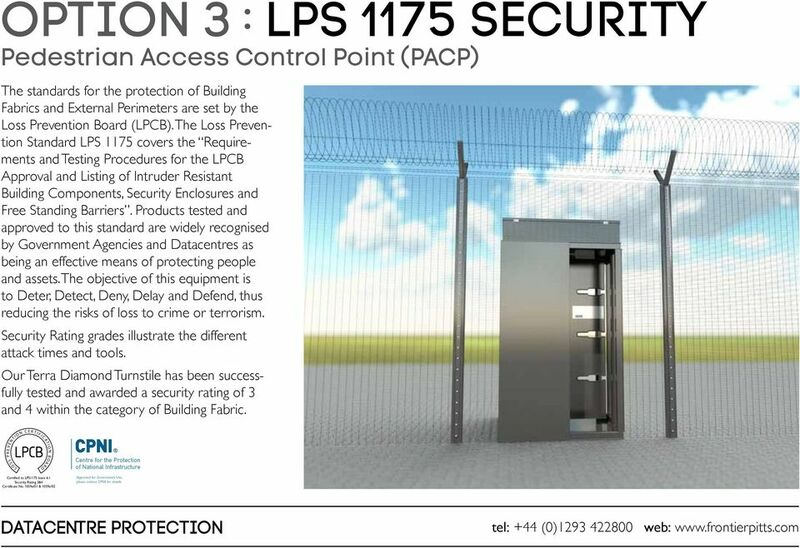 Every data centre location is unique; therefore a bespoke physical security protection solution needs to be designed for each site. To start, a detailed Risk and Threat Assessment needs to be carried out by a specialist who understands the potential threats, hazards, vulnerability and weaknesses. From this, an Operational Requirement is developed and an appropriate solution identified. 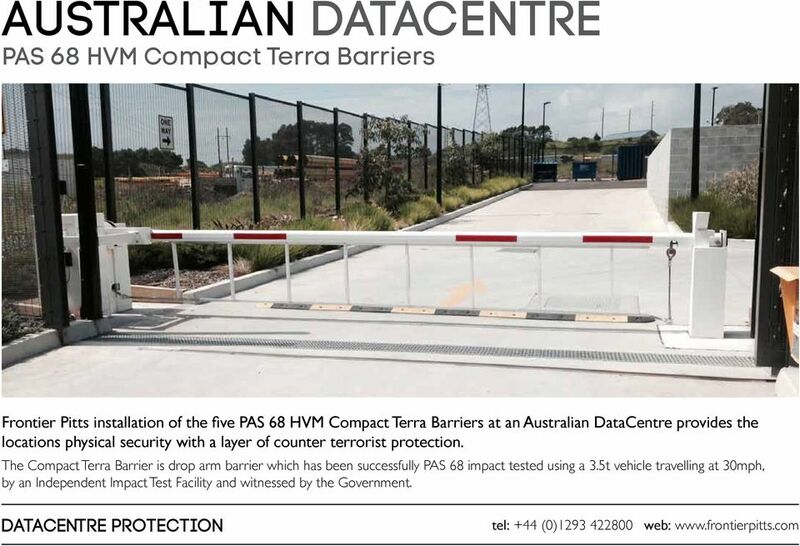 7 Australian Datacentre PAS 68 HVM Compact Terra Barriers Frontier Pitts installation of the five PAS 68 HVM Compact Terra Barriers at an Australian DataCentre provides the locations physical security with a layer of counter terrorist protection. The Compact Terra Barrier is drop arm barrier which has been successfully PAS 68 impact tested using a 3.5t vehicle travelling at 30mph, by an Independent Impact Test Facility and witnessed by the Government. 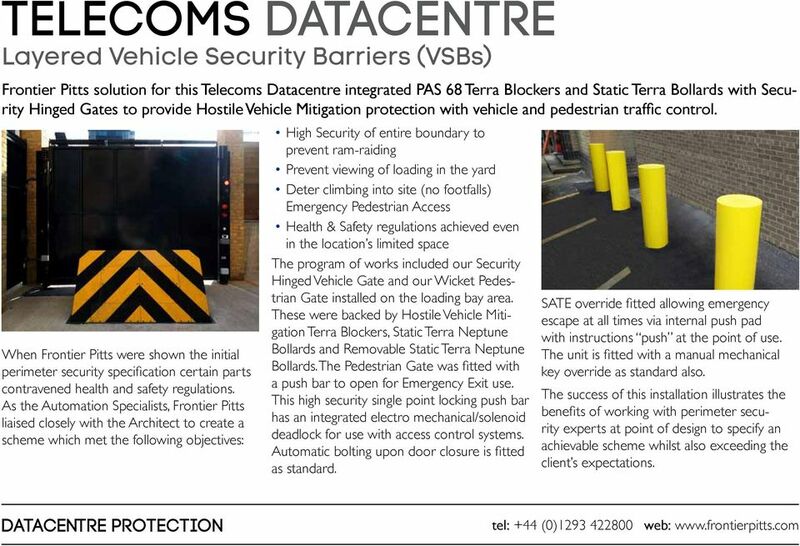 8 Telecoms Datacentre Layered Vehicle Security Barriers (VSBs) Frontier Pitts solution for this Telecoms Datacentre integrated PAS 68 Terra Blockers and Static Terra Bollards with Security Hinged Gates to provide Hostile Vehicle Mitigation protection with vehicle and pedestrian traffic control. When Frontier Pitts were shown the initial perimeter security specification certain parts contravened health and safety regulations. As the Automation Specialists, Frontier Pitts liaised closely with the Architect to create a scheme which met the following objectives: High Security of entire boundary to prevent ram-raiding Prevent viewing of loading in the yard Deter climbing into site (no footfalls) Emergency Pedestrian Access Health & Safety regulations achieved even in the location s limited space The program of works included our Security Hinged Vehicle Gate and our Wicket Pedestrian Gate installed on the loading bay area. These were backed by Hostile Vehicle Mitigation Terra Blockers, Static Terra Neptune Bollards and Removable Static Terra Neptune Bollards. The Pedestrian Gate was fitted with a push bar to open for Emergency Exit use. This high security single point locking push bar has an integrated electro mechanical/solenoid deadlock for use with access control systems. Automatic bolting upon door closure is fitted as standard. SATE override fitted allowing emergency escape at all times via internal push pad with instructions push at the point of use. The unit is fitted with a manual mechanical key override as standard also. The success of this installation illustrates the benefits of working with perimeter security experts at point of design to specify an achievable scheme whilst also exceeding the client s expectations. 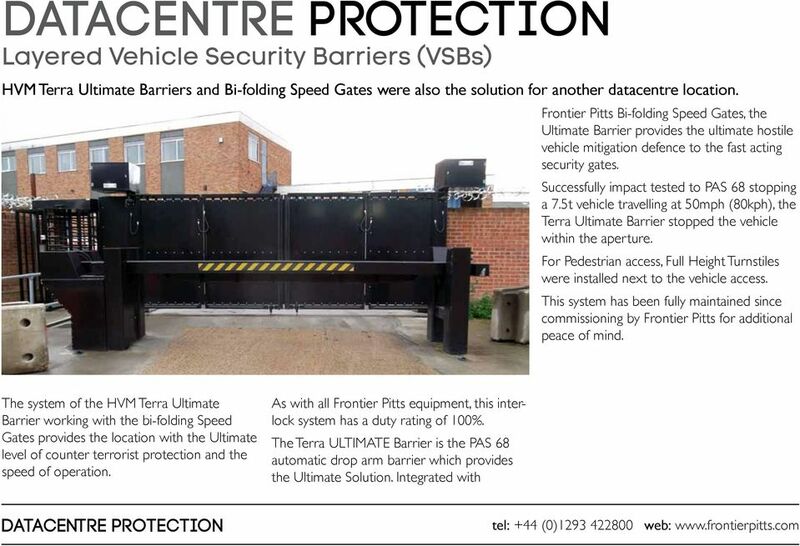 10 PAS 68 HVM Terra Gates, Blockers & Barriers Frontier Pitts PAS 68 HVM Terra Gate and Terra Barrier installation at a key UK Data Centre The PAS 68 Terra Gate has been successfully impact tested with a 7.5t vehicle travelling at 50mph (80kph - which equates to 1852kJ) in both the fully closed and half open positions. 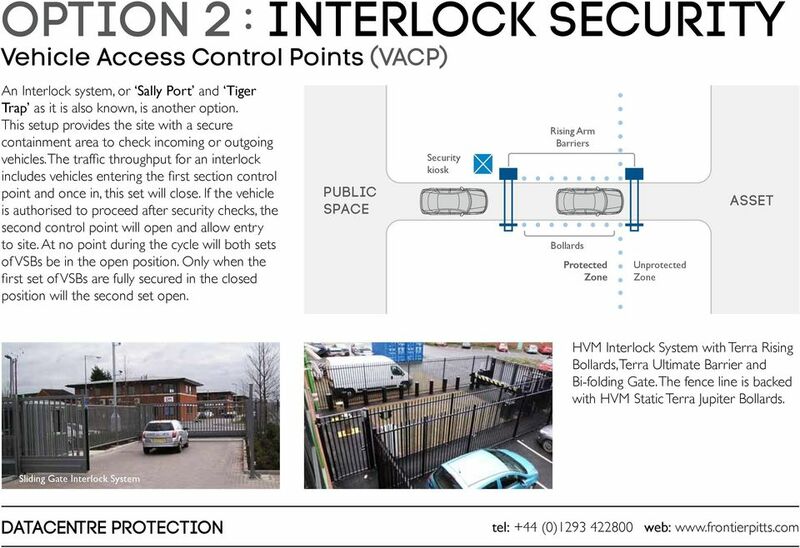 On both impacts the gate completely stopped the vehicle resulting in zero penetration on to site and the gate remained fully functional after impact. 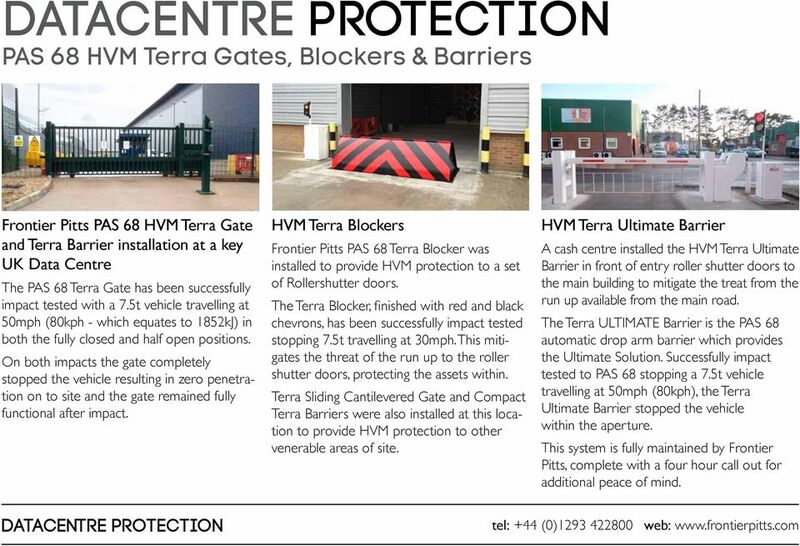 HVM Terra Blockers Frontier Pitts PAS 68 Terra Blocker was installed to provide HVM protection to a set of Rollershutter doors. The Terra Blocker, finished with red and black chevrons, has been successfully impact tested stopping 7.5t travelling at 30mph. This mitigates the threat of the run up to the roller shutter doors, protecting the assets within. Terra Sliding Cantilevered Gate and Compact Terra Barriers were also installed at this location to provide HVM protection to other venerable areas of site. HVM Terra Ultimate Barrier A cash centre installed the HVM Terra Ultimate Barrier in front of entry roller shutter doors to the main building to mitigate the treat from the run up available from the main road. The Terra ULTIMATE Barrier is the PAS 68 automatic drop arm barrier which provides the Ultimate Solution. Successfully impact tested to PAS 68 stopping a 7.5t vehicle travelling at 50mph (80kph), the Terra Ultimate Barrier stopped the vehicle within the aperture. 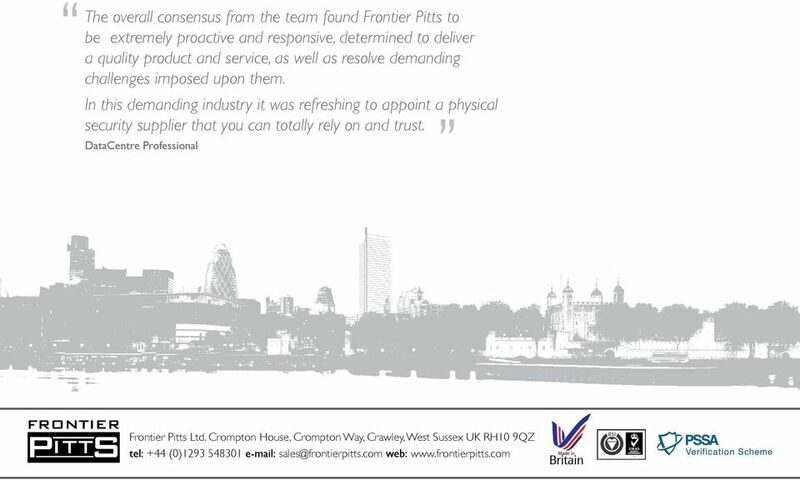 This system is fully maintained by Frontier Pitts, complete with a four hour call out for additional peace of mind. Not every cloud has a silver lining Arlene Adams (Founder & CEO of Peppermint Technology) Arlene Adams pulls on her experience to offer some simple steps for legal providers considering cloud computing. Data Centers, Information Technology and Low Current Services 1 Data Centers and Low Current Services SDT offers a wide-ranging variety of professional services to Data Centres and Low Current operators. Please print out and complete this form to reduce the risk of car theft happening to you. In Australia, seven in 10 late model vehicles are stolen by the thief gaining access to the vehicles keys or transponder.